A groundbreaking movie in its genre. When I saw this movie for the first time I was pretty amazed. For me this was one of the first really good 3D animation movie, and for its time it was really ground breaking. In my opinion however it is not as good as the second installmend, but still pretty good. The set of characters is rather good. I like the fear of introduction of new toys, and also the fact the not all toys know they are toys at first. The bad stuff of this movie is the kid named Sid. In my opinion his life is very unrealistic and maybe not a good signal to other kids. His toys are supposed to be scary, but at you get to know them thwy just seem lame to me. I think the best scene is the racing scene when they are riding the RC car near the end. This movie is absolutely recommendable for all Disney/Pixar fans. Even though it is not the best one, you still need to see it, as it is a cornerstone in modern animation movies. This is a review of the Danish dubbed version. In my optics that subtracts a mandatory star from the equation, it's just better in original language. 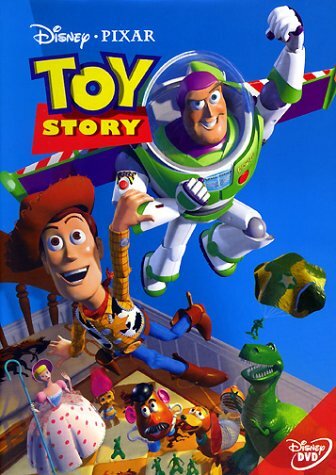 As far as I remember Toy Story was one of the first films in the new 3D animations wave which is actually still upon us. Being one of the first and there by being around 16 years old, this is an impressing movie. It has the usual Disney feel to it, which is rather predictable, but when it comes to kids-movies this is a good thing, I think. The effects/detail level bears great impact of being from the mid 90's, but that's not mighty important. Seeing this movie again reminds me of the great idea it was to bring toy to life. Of cause that's been done since the birth of fairy tales. My highlights of movie is when the toys uses their toy features in their reanimated form. So when Buz Lightyear almost chokes having is helmet opened, when Woody get's his pull-up wire caught and accidentally starts making noise and stuff like the small green army men jumping out with their parachutes. Well it made me wanna watch the two sequels so that must be a good thing.